In today’s cloud datacenters, the physical system is composed of individual server units contributing processing, memory, accelerators and storage resources. However, this arrangement incurs a significant waste of these resources as well as low power utilization, due to the inherent inability to closely match user IT requirements to the resources available within a single server or sets of servers. The challenge in this arrangement is to be more efficient, flexible and agile with these resources. dReDBox aspires to remedy this by moving from today’s server-as-the-unit model to a pooled-computing model, enabling an arbitrary sizing of disaggregated IT resources, deploying them where and when required, to perfectly match cloud user requirements. By doing so, dReDBox aims to transition cloud to unprecedented efficiency levels while reducing electric power consumption by up to 20%. The consortium plans to deliver a full-fledged, vertically integrated datacenter-in-a-box prototype to showcase the superiority of disaggregation in terms of scalability, efficiency, reliability, performance and energy reduction. The prototype will be used as vehicle to demonstrate the value of dReDBox in three pilot use-cases stemming from three market segments: Security, Network Analytics and Telecom. 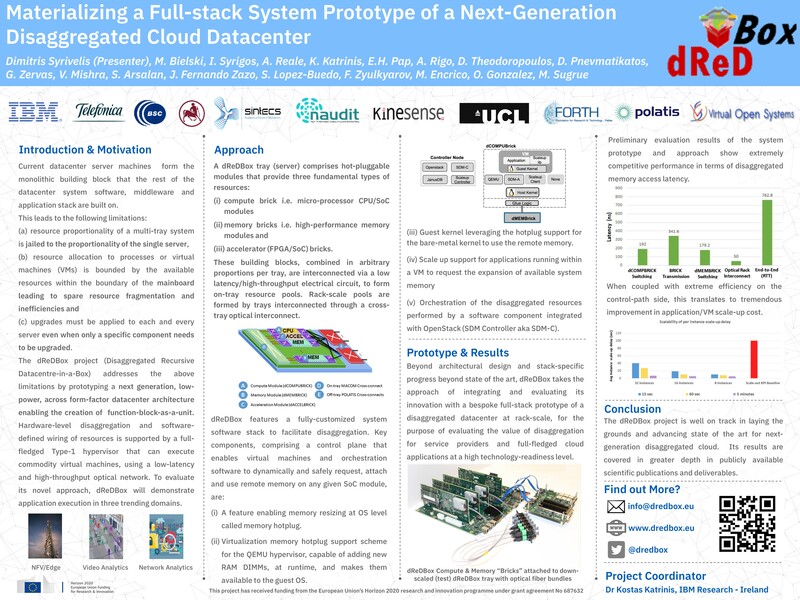 The dReDBox consortium is lead by IBM Research Ireland and features a versatile set of prominent European R&D organizations, including Telefonica (Spain), UCL (UK), University of Thessaly (Greece), the Foundation for Research and Technology (Greece), Barcelona Supercomputing Center (Spain), Naudit (Spain), Sintecs (Netherlands), Virtual Open Systems (France) and Kinesense (Ireland).